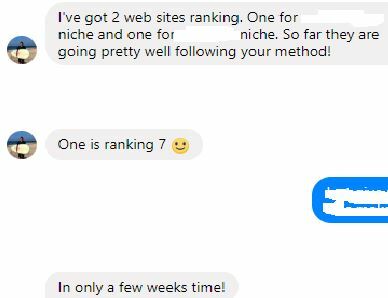 He has 2 sites ranking in 2 pretty competitive niches in just a few weeks!! He was serious about changing his life, took action, coughed up the tuition fees (just like paying for any skill), and is now reaping the results. And he is urging other members of our fb group to take the leap and get the course because he knows its such a steal for $797! Here is another pm from another student who took advantage of the Black Friday Sale. He is enjoying the videos and getting value out of it. And you know what – I have no doubt he will send me a pm in a few weeks saying his website is ranking on page 1!! Why? Because this is a proven step by step method I have used again and again to make passive recurring income! !